Earn 5.25 SB per $ when you buy AMC Theatres gift cards at MyGiftCardsPlus, powered by Swagbucks. AMCÃ‚Â® Theatres gift cards are perfect for any occasion. These digital bundles of joy can be redeemed for movie tickets as well as concessions and other dining options at any AMC TheatresÃ‚Â®, AMCÃ‚Â® Loews, AMC Showplace, CineplexÃ‚Â® Odeon , Magic Johnson and Star theatres in the US. 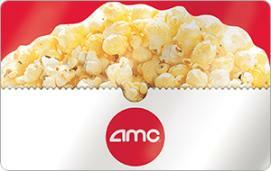 Whether youÃ¢â‚¬â„¢re a movie buff, popcorn junkie, softie for soda or a chocolate connoisseur, youÃ¢â‚¬â„¢ll love the AMC eCard.